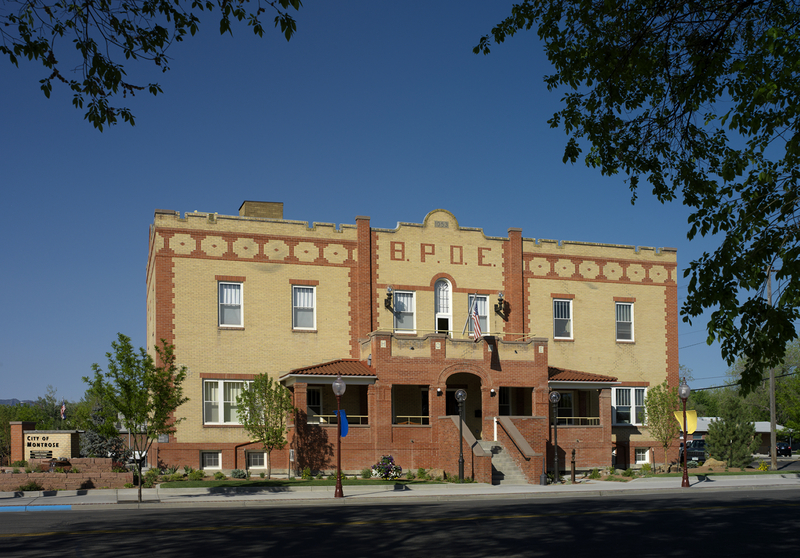 The Elks Lodge in Montrose, Colorado, an award winning adaptive reuse project, now serves as a municipal services center and meeting venue. The restoration included the installation of a renewable energy geo-exchange system for heating and cooling. 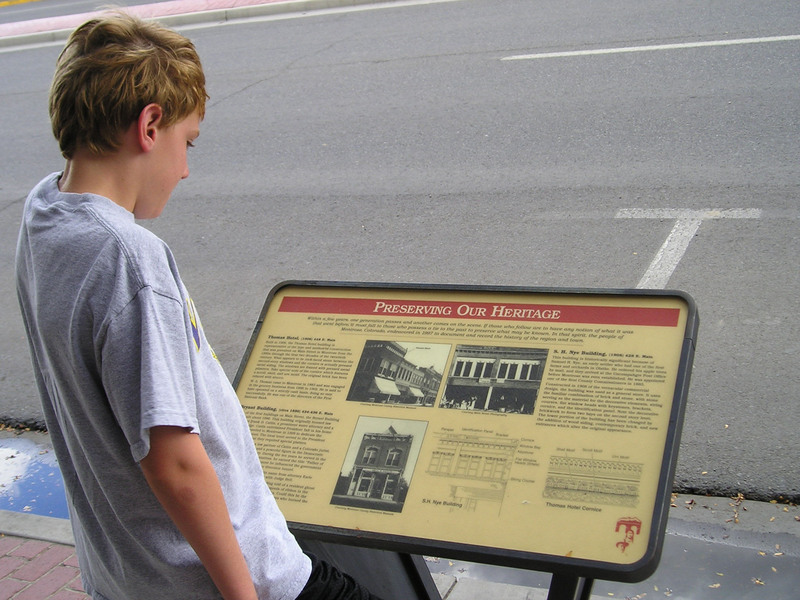 A Downtown Historical Walking Tour in Montrose, Colorado, takes visitors past 12 interpretive signs which tell about the early history of the Uncompahgre Valley. Montrose, Colorado, (population 16,486) located in the Uncompahgre Valley and incorporated in 1882, serves as a gateway to the Black Canyon National Park to the east and resort towns to the south. It is also a service center for surrounding communities and local farms. The Ute Indians who inhabited the valley and the San Juan Mountains prior to the 1880s were largely relocated from the valley in 1881. With the founding of Montrose, settlers constructed irrigation canals from the Uncompahgre River and transformed the arid valley into a farming region. The rail link between Montrose and Gunnison allowed Montrose to become an outfitting point for mining towns in the San Juans and secured the town’s position of county seat in 1883. As the population grew, the railroad upgraded its line from narrow gauge to standard gauge in 1906, and the Gunnison Tunnel, completed in 1909 and still in use today, diverted water from the Gunnison River into the Uncompahgre Valley. Agriculture has remained a constant in the economy, while mining has declined and tourism has increased. In 2007 Montrose celebrated its 125th birthday with numerous events, programs, and historic projects. A new walking tour guidebook, a new preservation awards program for downtown property owners, and the Monte De Rosas annual festival celebrating local Hispanic history were all part of the commemoration. Montrose has adopted a Downtown Development Plan, and undertaken award winning adaptive reuse projects, including rehabilitating the Elks Lodge—now a municipal services center and meeting venue. The Elks Lodge restoration included the installation of a renewable energy geo-exchange system for heating and cooling. The historic City Hall, across from the Elks Civic Building, is also undergoing stabilization and restoration. Much of the cultural and historical legacy of Montrose County is preserved and displayed at the Montrose Historical Society Depot Museum, housed in the 1912 Denver and Rio Grande Depot Building, a National Historic Landmark. The museum is noted for having one of the most extensive collections of farm machinery in Colorado. It also houses a walk-through homesteader’s cabin, “Country Store,” children’s corner, and library. The city of Montrose is also involved in a collaborative effort with three Ute tribes to expand the Ute Indian Museum and interpretive site. This museum is the only museum in the United States dedicated entirely to one tribe and tells the story of two of the most noted figures in Colorado history: Chief Ouray and his wife Chipeta. The museum grounds include Ouray Memorial Park, Chipeta’s grave, and a native plants garden. A Downtown Historical Walking Tour takes visitors past 12 interpretive signs which tell about the early history of the Uncompahgre Valley. The Star Drive-In on Miami Road in Montrose is one of the last drive-in movie theaters in Colorado.